The wonderfully sweet Lexie of Little Boat asked me recently if I wanted to do a little clothing swap. 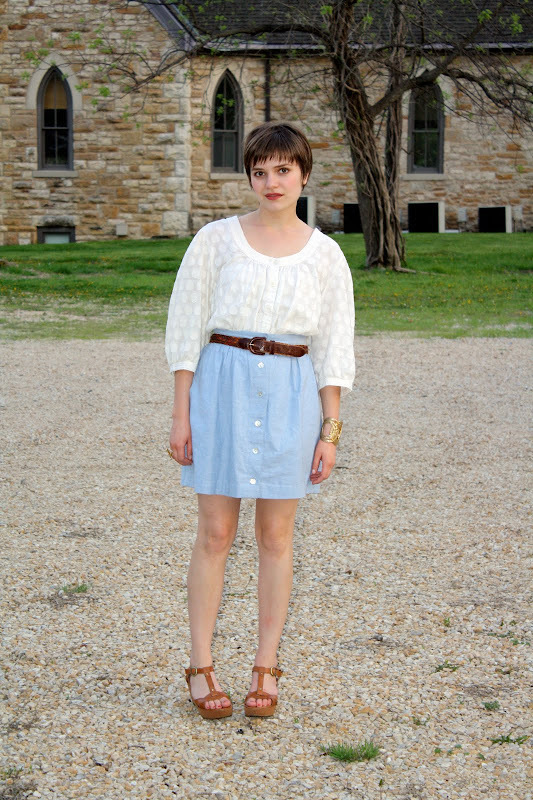 One of the items she sent me was this adorable and amazingly versatile chambray skirt. I've already worn it at least four times. For this look, I paired it with a peasanty blouse and simple accessories for a Stella McCartney feel. what a great look. i'm going to try my hand at making a chambray skirt this week. wish me luck. very cute look. i love clothing swaps; never thought of doing them this way. Yay for clothing swaps! I like this outfit, but I think that the sleeves take away from your shape a bit. Still cute! love doing that too. are there pics of lexie wearing the skirt too? awww! the skirt looks so good on you! this post made me smile! oooh, what a great item to receive! SO versatile! You look fantastic, lady! i love the colors! springtime! So sweet and easy. I love it! Eeek, eek, eek. Just discovered your blog and I am love-ing it..... So lovely. Love your shirt, so vintage look! I thrifted a skirt very similar to this a few weeks ago. Unfortunately, mine is ankle length and a bit to much of the little house vibe. I really need to alter it after seeing these pictures, so beautiful. And I really can't get over your hair, I love it. It makes me want to cut mine all off.